New and Now Available... Celebrating its 33rd year, the 2019 MFC theme engages us to realize that there is less that separates us than brings us together. It includes information about 14 faith groups and 370 + significant religious and cultural occasions / observances. A unique and invaluable education resource for: faith leaders, educators, the workplace, and family/home discussion and celebration. they don't know each other because they have not communicated with each other. It is our intention to provide tools that will guide you in experiencing the beauty in all the world's religions - both with your head and your heart! Some items will be for education while others for inspiration! Our service and attention doesn’t end after your order. 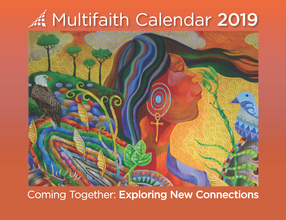 Keep informed and up-to-date on interfaith events as well as new Interfaith Marketplace products / specials by visiting our web site or Twitter account often. Join us in celebrating all religions!